School of Medicine and Future Care published a preliminary study based on data obtained from six years of medical incidents managed under Future Care, Inc.’s “Caring for the Crew Program.” Goals of the study included characterization of medical events and services provided, cataloguing and analyzing medical expenses, determining risk factors for the develop- ment of medical events and developing intervention strategies to reduce injury and illness. Care cases were due to illness, 32.6% were the result of injury, and 13.0% were dental issues. Age, gender and nationality strati- fi ed distributions of diagnoses, along with their associated costs, were calculated. Results of these analyses revealed that Asians accounted for the greatest percentage of medical events (46.3%) and, not surprisingly (the vast majority of mariners are male), 97.5% of all medical events occurred to males. 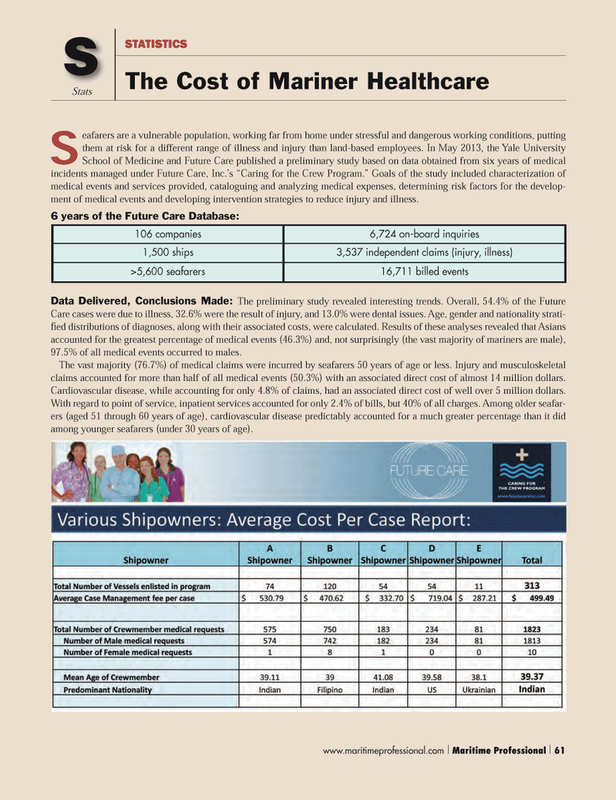 The vast majority (76.7%) of medical claims were incurred by seafarers 50 years of age or less. Injury and musculoskeletal claims accounted for more than half of all medical events (50.3%) with an associated direct cost of almost 14 million dollars. Cardiovascular disease, while accounting for only 4.8% of claims, had an associated direct cost of well over 5 million dollars. With regard to point of service, inpatient services accounted for only 2.4% of bills, but 40% of all charges. Among older seafar- ers (aged 51 through 60 years of age), cardiovascular disease predictably accounted for a much greater percentage than it did among younger seafarers (under 30 years of age). Yale University School of Medicine inpatient services Future Care Inc.